ahh barbie looks sooo pretty she will fit in perfectly with my mint condition life supply amount of barbies from 1959-2009! 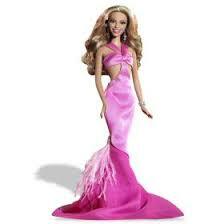 AHHHH lol jk im to old for barbies ( or am I ? I’ll never tell!) and 1959 was a WHILE ago, i wasnt even born then. this post seems sorta weird doesnt it? at first it makes me sound obessed with her. Ohh speakingof strange word (or was it barbies?!?) did you hear mariahs song Obessed? well duh who HASENT?!?!? but did you see the videos. AHA got’cha! well the guy in the strange gotatee was supposed to be emieneim! that was mean. but then did you hear emieniem song ”the warning”? to many curses uhh i HAD to turn it off. hes crazy. i know he was super mad but really relax . that rocked but i hate how kanye west inturped taylor like shutup. <whooo michelle calm down> ok yea, idk y but in my head i saw just like a ton of people BOOING at kanye and talylor all laughing and stuff. she had the evil laugh to. they i woke up. strange huh? her laugh was like MWAHAHAHAHHAHAHA but in a very high pitched voice. oh well ths is hurting my brain remebering this stuff. BYE! !